Reflective practice is an important part of the documentation process for educators but it is often neglected because of a lack of understanding or confidence about what is required. Reflective practice can be implemented when an educator thinks critically about an event, action or experience to draw meaning from the situation. This meaning is used to inform future planning and learning outcomes. The National Quality Standards require reflection to be an integral part of a services documentation practice, to guide programming and improve outcomes for children. NQS 1.2.3 Critical reflection on children’s learning and development, both as individuals and in groups, is regularly used to implement the program. There are three types of reflection as described by Donal Schon and Killon & Todnem which forms a cycle of reflection. Reflection-on-action = Reflection after the activity. What went well in the activity? What could have been done to improve the activity? What have I learnt about a child or children which is relevant to future interactions? Was there any bias, gender, age or cultural, in the activity? Reflection-in-action = During the activity. How can I improve things at this very moment? Are my or the students expectation being met right now? What changes need to be made to achieve outcomes? What is the child or children telling me verbally or by their actions which may improve their enjoyment or learning? What actions can I take now to mitigate bias in this activity? 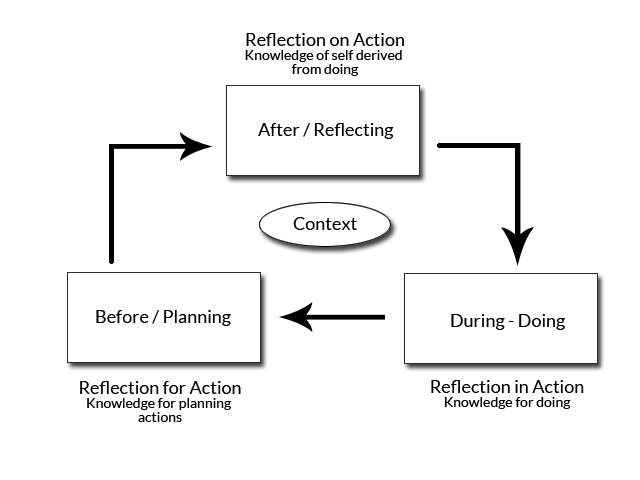 Reflection-for-action = Before the activity. What are my past experiences telling me I should do to improve this activity? Can I foresee any problems? What can I do to avert perceived problems? What outcomes can realistically be met? What do I know about the child or children which can inform my planning? Is there a way I can plan the activity to minimize bias? Reflective practice can take the form of written documentation, discussions with peers and educational leaders, or part of your internal thought process. Incorporating daily reflective sessions individually or as part of a group of peers may highlight aspects where improvement can be made. Develop individual goals for students (reflection-for-action) as part of the curriculum. Tip: Open a new plan in One Child and select goal as the plan type and link it to one or many children depending on the activity and desired outcome. Document an observation and include a reflective paragraph (reflection-on-action) about the observation. Tip: After creating a learning story in One Child link a reflection and highlight future ideas to extend learning. Reference previous observations and/or reflections in your planning templates or documentation (reflection-for-action). Tip: Link learning stories to a plan to show programming development. In One Child we call this ‘Threads’ of learning which you can see as a visual representation in each story where links are made. Take photographs, record feedback and collect work samples during activities (reflection-in-action). Tip: Add media to learning stories to provide evidence of completed tasks or related learning outcomes. One Child allows you to add media easily to your documentation. Do you find reflective practice difficult? Are there any strategies you use to support reflective practice at your centre? Need an example activity with reflective questions to try out? Take a look at Truth, Truth Trick or Egg carton creations.